Copenhagenize.com - Bicycle Urbanism by Design: Do Copenhagen Police Make it Up As They Go Along? 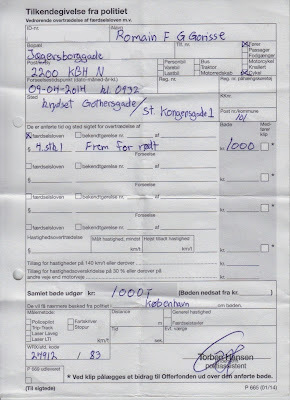 Do Copenhagen Police Make it Up As They Go Along? You know you live in a a car-centric city when it's not allowed for bicycle users to turn right on red. Despite the fact that it's legal in many European cities in France, Belgium and be tested in many others, like Basel. Despite the fact that it is one of the most obvious things to implement to encourage cycling and keep bicycle users safe. A French friend new to Copenhagen had seen that a few Copenhageners turned right on red - only a small number, of course, as we've figured out - but one day in April he was stopped by Torben. Torben is a civil servant - a policeman - and that day he was out trying to meet the quotas necessary to please his boss. Bicycle users are the low-hanging fruit for such situations. Going after motorists is time-consuming and tiring. Just stand at the usual spots and hand out fines for minor infractions - many of which that don't have a place in the law books in a modern city. 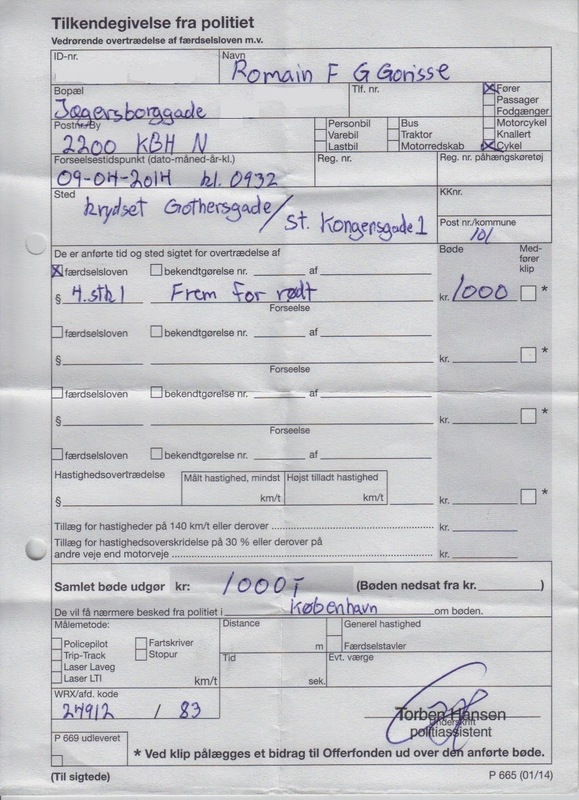 So Torben was just doing his job, as dictated by his superiors. It isn't known whether Torben was one of the many police officers who have publicly criticized the fact that they are forced to hand out traffic tickets to meet quotas. Torben, however, seems to have some issues with understanding the basic rules about cycling. Fine, turning right on red isn't allowed at the intersection in question - Store Kongensgade/Gothersgade - so stopping my friend Romain is fair enough. A newcomer to Copenhagen - from a city where right turns on red for bicycle users is allowed at a number of intersections - could be forgiven for not knowing that Copenhagen hasn't yet removed this archaeic law. You'd think some respect and flexibility for foreigners navigating the city would be in its place, especially since Romain rolled calmly around the corner without bothering any pedestrians or other traffic users. Torben informed Romain that his bicycle is required to have two brakes. The coaster brake on its own wasn't enough. Again, how are visitors supposed to know that Denmark has many obscure laws like this? Flexibility for visitors, please. You'll still make your quotas if you put your mind to it, Torben. Then it all got a bit strange. Torben informed our visitor that his bicycle was also required to have magnetic lights and fenders. That it was illegal to ride it in Copenhagen. Magnetic lights are well-known in Denmark, but how on earth should a Frenchman have heard of them? And fenders? It's a no-brainer that fenders make sense for city cycling, sure, but you know what? It is not required by any law that a bicycle be equipped with magnetic lights (it was also broad daylight) or fenders. The fine ($200) only covered the right turn on red but it left Romain very confused. Romain emailed me to ask about these bizarre claims by Torben and I explained it to him. I also explained that he join the Cykelrazzia Facebook group in order to coordinate with almost 2000 other bicycle users in Copenhagen about the placement of the police's quota traps each day. Can somebody tell our dear civil servant Torben the facts? And make sure his colleagues are in the same loop? It's no secret that the Copenhagen Police are among the most bicycle unfriendly in Europe, but when it gets this silly, it doesn't help anyone.